A jealous man who murdered his girlfriend after getting "paranoid" about her being unfaithful to him has been jailed for at least 18 years. Xixi Bi, 24, died in hospital after the attack by Jordan Matthews, 24, at their flat in Llandaff, Cardiff, in August. He was sentenced to life at Cardiff Crown Court on Tuesday and must serve at least 18 years after being found guilty by a jury last week. Judge Nicola Davies said Matthews had relentlessly attacked Miss Bi. The assault was the "tragic culmination" of a course of physical and verbal abuse over a number of months, Judge Davies said. Her brother, Zexun Bi, said "the heart has been ripped out of our family". 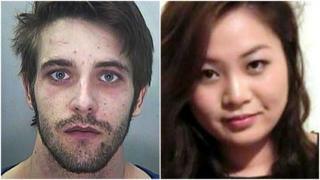 Barman Matthews admitted manslaughter but denied the murder of Miss Bi, a post-graduate student at Cardiff Metropolitan University. She suffered 41 injuries as a result of the attack, including a broken jaw and ribs. In a victim impact statement, her brother said his sister had been due to run their family's multimillion-pound company and had the "whole world in front of her". "No sentence imposed will ever reflect the heartache and pain he has inflicted upon my family," it read. "Xixi will always be in our hearts, no matter how broken they are." During the trial, the court heard Matthews, who said he had a black belt in karate, regularly beat Miss Bi and called her "worthless". Matthews said he hit Miss Bi, believing she had cheated on him, and cried when he was later told she was dead. He accepted he was smoking "quite a lot" of cannabis at the time and the court heard he felt "insecure" when his girlfriend visited her family in China. He said he became "paranoid" about Miss Bi being unfaithful to him and believed she had received a message from someone called Ben on the Tinder dating app. Miss Bi did not have the Tinder app or any contacts called Ben. Christopher Henley QC, defending, said Matthews "misses her, he loved her, but he accepts that the way he treated her was atrocious". Judge Davies said: "Xixi provided you with a home, clothing, she bought a car for you. You took what she gave. "You lied and lied again in order to attempt to exculpate yourself from the overwhelming evidence which was that during the early hours of August 19 2016 you relentlessly and remorselessly inflicted physical injury upon a defenceless young woman."